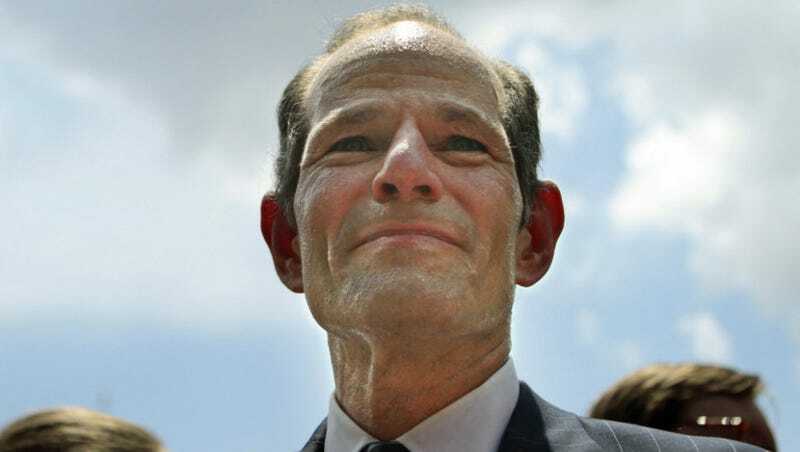 Ex-New York Governor Eliot Spitzer, knocked out of office during a prostitution scandal in 2008, is reportedly being investigated for choking a 25-year-old woman during an argument at the Plaza Hotel. The woman, Svetlana Travis, is said to have told police the two had been together for the past two years. He was also dating Democratic strategist Lis Smith for the past two years. The incident at the Plaza, as law enforcement sources told seemingly every media outlet in town, allegedly began after Travis told Spitzer she was leaving the city, going back to her native Russia. ABC 7 reports that that the two “ have had a romantic relationship for almost two years,” and that the “spat,” as they referred to it, began when she broke the news of her imminent departure. According to reports, Travis called 911 and told an operator she attempted to slash her wrists and was having a breakdown. Spitzer met responding officers at the door of the hotel room and said there was no problem; they later returned and found “blood and glass,” per numerous media reports, and took Travis to the hospital, where she said Spitzer had choked her. Spitzer’s romantic life has been notably rocky these last eight years, a storminess one could plausibly attribute to what appears to be his consistently terrible judgment. After being infamously outed as Client 9 and leaving the governorship in the most embarrassing way possible, he attempted a return to politics in 2013, running for (and losing) the position of city comptroller. Meanwhile, his wife of 25 years, Silda Spitzer, remained married to him, more or less, although in July 2013 they were said to be living apart and she was reportedly plotting a post-election emancipation. That’s exactly what happened: the Spitzers announced they were divorcing in December of that year, about six weeks after that lost election. Silda got $7.5 million along with an extremely strict confidentiality agreement. The divorce was announced three days after Spitzer was seen leaving Lis Smith’s apartment; she was then working on the transition team for mayor-elect Bill de Blasio. Smith reportedly lost out on a permanent job with the de Blasio administration after her relationship with Spitzer became public (and after what the New York Times noted was “relentless tabloid coverage that included a Post cover with a picture of Ms. Smith and the headline “Ho! Ho! Ho!”). Smith went on to become the deputy campaign manager for Martin O’Malley, while Spitzer...good question. What was he doing? Oh yes: in July 2015 the Times reported that, having had his short-lived CNN show canceled back in 2011, he was working in the family real estate business. He was also seen with Smith at fundraisers and at the theater, and people were expressing polite surprise he’d managed to hang on to her. “I must admit I was surprised to see him holding her hand,” one fundraiser attendee told the New York Daily News. Truer words. etc. It’s unclear when Spitzer got to know Svetlana Travis, if the two were indeed dating, or whether the nature of his relationship with Smith was monogamous. But we do know that in December 2015, Smith and Spitzer were reported to have split up. She got the cat. A hearty congratulations to everyone who is no longer dating or wedded to Eliot Spitzer. “You tried to save me,” she wrote to Mr. Spitzer, according to the copy of the email provided by Mr. Kaufmann. Spitzer in July 2013. Image via AP.